Summary: Aite Group finds different small business sizes approach loans in different ways. What your bank should know. 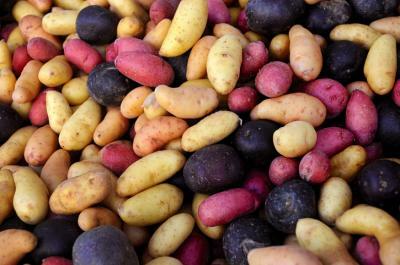 If you are worried about colon cancer, perhaps you should start munching on purple potatoes. It seems Pennsylvania State University researchers have found doing so might reduce proteins linked to the growth of cancer cells in the colon. More work needs to be done, but maybe restaurants will start offering them soon if people start asking. Who knows! In the competitive world of small business lending, colorful things have little to do with knowing and understanding your potential customers. Interestingly, banks often think more in terms of customer demographics or small business industry than business size. This is weird because not matter how you shade it, an Aite Group study finds different small business sizes approach loans in different ways. That means a one-size-fits-all approach to small business lending can miss the nuances. Failing to understand what different business owners need and want can undercut the overall lending strategy. The Aite survey provides some important insights into the tiers of small business types. Aite surveyed 600 small businesses, including 500 that had applied for loans within the prior 2Ys. The report identified three small business types by size: micro businesses, small businesses and mid-size businesses. Each group identified its own set of challenges and needs, as well as differences in attitudes towards loans. As might be expected, microbusinesses (generally those with five or fewer employees) have a very different lending profile from small businesses (which have up to 100 employees) or mid-size businesses (100-999 employees). For example, micro businesses are more likely to trust alternative lenders than are larger businesses. So, when looking to lend to micro businesses, community banks should be aware that alternative lenders may be especially strong competitors. The survey also digs a little deeper into the issue of debt-averse business owners. An earlier Aite survey of the broad category of small business owners who don't borrow found that 50% carried no loans because they felt they had enough cash flow or savings to cover expenses. The latest survey helps identify who those loan-averse owners are. It turns out they are most likely to fall into the category of small (5-100 employee) businesses rather than micro or mid-size. That distinction makes some intuitive sense: micro businesses are often struggling and need loans, while larger businesses tend to have more cashflows to pay for continued expansion. Another important distinction in this survey is where businesses of various sizes turn to for advice on loans. Mid-size firms rely on their CFO, while small businesses look to their personal networks or the internet for guidance and information. The most important loan influencers for micro businesses are owners and partners. Another important distinction for micro-businesses is in the underwriting process. Micro-businesses are far more likely to want and need credit evaluation that extends beyond rating agency data. After all, these businesses have less of a track record. To attract micro clients, it is important to understand and deal directly with the owners and partners, and to understand what's being offered by alternative lenders. If the target is at the other end of the size spectrum, you will want to talk to the CFO. Finally, when dealing with the group in the middle, keep in mind that many businesses are stable enough to be able to continue without borrowing, so the pitch needs to include some value that can be added with extra borrowed money. In short, when marketing loan services to small businesses keep in mind that the number of employees in the company is a strong indicator of what the business may need and who the key influencers are. That can help hone your product offering and where to direct it. That should position your bank nicely no matter the size of the business customer in question. Yields slid 5bp as tensions continued to mount over the Fed Chair announcement and Catalonia votes for independence from Spain. 1) The First ($1.8B, MS) will acquire First Community Bank ($398mm, AL) for about $60mm in cash (40%) and stock (60%) or about 1.66x tangible book. 2) Bangor Savings Bank ($3.7B, ME) will acquire Granite Bank ($262mm, NH) for about $45mm in cash (100%) or about 1.85x tangible book. 3) Peoples Bank ($3.6B, OH) will acquire American Savings Bank ($294mm, OH) for about $39.6mm in cash (15%) and stock (85%) or about 1.53x tangible book. 4) Glacier Bank ($9.7B, MT) will acquire First Security Bank ($1.0B, MT) for about $173.4mm in stock (100%) or about 2.17x tangible book. Customers Bancorp ($10.9B, PA) will sell its BankMobile division in order to avoid Durbin amendment issues. BankMobile will combine with Flagship Community Bank ($125mm, FL) and become majority owned by Customers shareholders. Walgreens announced it will close almost 600 Rite Aid stores in order to comply with anti-trust rules and as part of the deal to buy its rival started 2Ys ago. This move also helps Walgreens streamline locations, as comparable retail sales fell 2.1% in its most recent quarter for its own stores. Banks should be aware and check the loan portfolio for potential exposures to these locations.